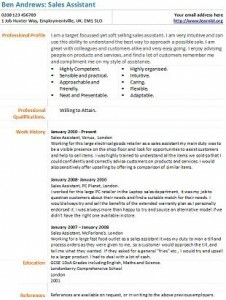 Sales Assistant CV example and template. Amend as suitable and write your own CV in seconds. This example of CV is completely free to use by jobseekers. Sales Assistant jobs can be found on the job sites online. These days Social Media is also great place to search jobs including Linkedin, Twitter and Facebook. Sales Assistant job application letter example. Click on the image to download the CV in doc to amend it as suitable and use it for your job applications. I am a target focussed yet soft selling sales assistant. I am very intuitive and can use this ability to understand the best way to approach a possible sale. I am great with colleagues and customers alike and very easy going. I enjoy advising people on products and services, and find a lot of customers remember me and compliment me on my style of assistance. Professional Qualifications. Willing to Attain. Working for this large electrical goods retailer as a sales assistant my main duty was to be a visible presence on the shop floor and look for opportunities to assist customers and help to sell items. I was highly trained to understand all the items we sold so that I could confidently and correctly advise customers on products and services. I would also sensitively offer upselling by offering a comparison of similar items. Sales Assistant, PC Planet, London. I worked for this large PC retailer in the Laptop sales department, it was my job to question customers about their needs and find a suitable match for their needs. I would always try and sell the benefits of the extended warranty plan as I personally endorsed it. I was always more than happy to try and source an alternative model if we didn’t have the right one available in store. Working for a large fast food outlet as a sales assistant it was my duty to man a till and process orders as they were given to me, so a customer would approach the till, and tell me what they wanted. IF they asked for a general “fries” etc., I would try and upsell to a larger product. I had to deal with a lot of cash. If you have any questions about your CV then use the comment form below to ask. We will answer your questions very quickly. Good luck with your job hunting in Retail industry.